As the world’s leading cybersecurity company, Palo Alto Networks is focused on protecting companies and consumers with innovative tools for digital security, automation, and analytics. So, it was important for the company’s new headquarters to reflect its focus on innovation and its core culture of teamwork, diversity, community, and environment. Working alongside the team at RMW Architecture, we were thrilled to contribute to the campus design – with beautiful and functional Courtyard Tension Structures. 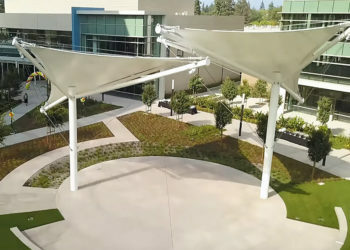 Located at THE CAMPUS AT 3333, the new Palo Alto Networks corporate campus is a state-of-the-art LEED Silver Facility in Santa Clara, California. The property boasts three 8-story buildings, one 2-story amenity building, and two parking garages – making it an impressive Class-A office campus. 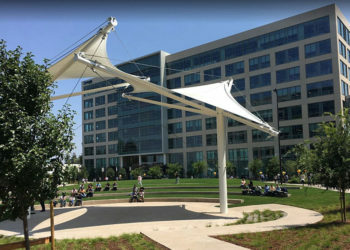 RMW Architecture was looking for free-standing shade solutions for the campus, and the Eide team envisioned a grouping of courtyard tension structures that would complement the campus theme and help to foster that essential culture of innovation and teamwork among employees and visitors. 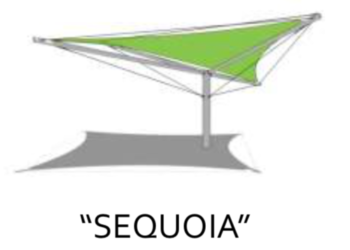 With five in total, the courtyard tension structures were designed as two modified Sequoia shapes that covered the larger gathering area and three Willow shapes that created more private meeting areas – resulting in approximately 3,200 sq.ft. of shade coverage. Combined Coverage is approx. 2,600 sq.ft. A white Serge Ferrari Précontraint TX30 II PVC was chosen for its high-performance qualities and superior light transmission capabilities. The structures are engineered for up to 110 MPH wind loads (Exposure C) and have a Category D Seismic Design. 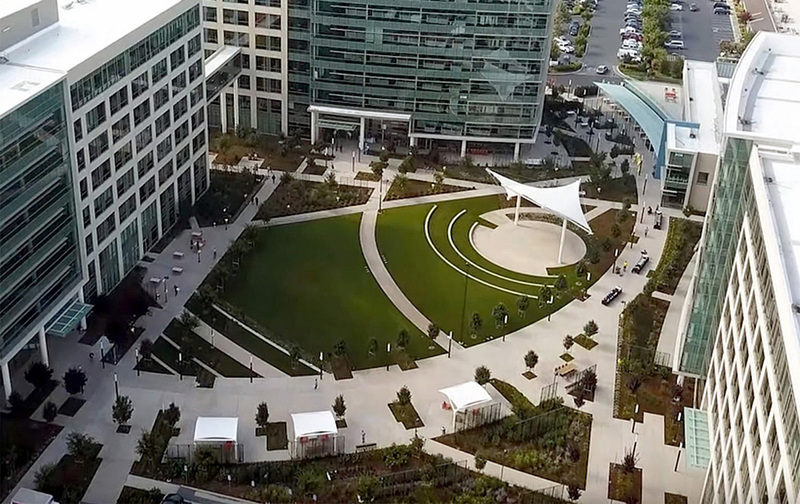 In partnership with Maniglia Landscape, the canopies were fabricated and installed by Eide’s Installation Team. 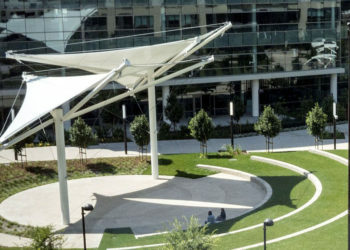 In the end, the project provided more than just a shady place for employees and visitors to meet and/or relax – the courtyard tension structures also became the signature landscape pieces for the newest corporate campus in the Bay Area. 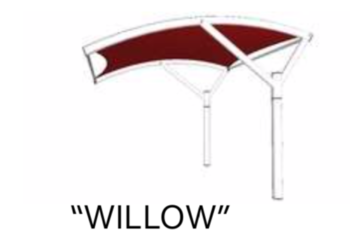 Are Courtyard Tension Structures Right for Your Next Project?